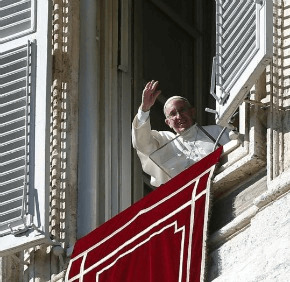 VATICAN CITY – Jesus’ loving gaze of tenderness and mercy extends to all who seek forgiveness no matter how great or small their sins may be, Pope Francis said. While many often feel “cast aside” because of their sins, Jesus offers encouragement and “tells us, ‘Courage, come to me,'” the pope said Aug. 31 at his weekly general audience. Reflecting on the Gospel reading of Jesus’ miraculous healing of a woman suffering from hemorrhages, Pope Francis noted the woman’s persistence in trying to reach out to Jesus despite the fact that she was excluded from society because of her condition. This gaze and encouragement from Christ, he added, also is experienced by all those who feel discarded and marginalized by their own sins. “Once again Jesus, with his merciful behavior, shows the church the path it must take to reach out to every person so that each one can be healed in body and spirit and recover his or her dignity as a child of God,” the pope said.